Home Tags Articles tagged with "students"
The mayor was 12 years old. The director of the Economic Development Department was just 11. And if they had the power, Maricopa would have a welcome sign on the north end of town. 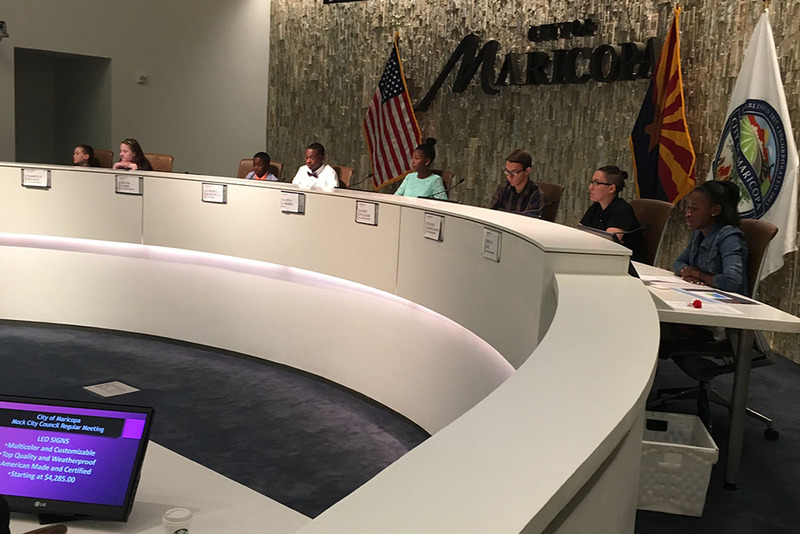 The Mock City Council meeting Saturday saw Maricopa teens and preteens going through the actions of a real city government. 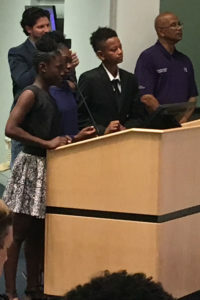 Coming from eight schools, the students filled the seats of council, department directors, project designers, city attorney, city manager and city clerk. The event was part of the Councilmember on the Corner series produced by Councilmember Henry Wade. He said it was a five-week process, with student holding an election to decide the councilmembers. The discussion of the mock meeting was a proposal for a monument sign to welcome visitors to town. After a brief work session with a presentation on the proposal by the pseudo economic development director and public works director, there was a “regular” in which actual community members spoke for and against the project. Council and the city attorney, too, grilled the department heads about cost ($100,000-$250,000), location and energy source for an LED aspect to a monument sign. Ultimately, Mayor Deanna Lemorin of Legacy Traditional and her six-member council unanimously approved the project. Lemorin also read a proclamation declaring May 19 Student Day in Maricopa. Speaking to the mock council, real Vice Mayor Peg Chapados said she would like to bring the monument sign proposal to the real council in the future. “I like Maricopa because it’s very small and tight-knit and because of that we can do things like this,” said 15-year-old Kadin Pulliam of Desert Vista High School who served as a councilmember. Judge Lyle Riggs, the real city magistrate and justice of the peace, also invited the students to participate in Teen Court, which tries real cases. These comments resound among students in Maricopa and present a challenge for parents and educators. News media is filled with reports on the rising costs of college and the declining worth of college degrees – and students are internalizing the message. Giving up; abandoning hope and potential without even considering the options. However, many of our Maricopa students have plenty of affordable options; they simply do not realize it. Maricopa Unified School District is a Title I district, indicating 50 percent or more of students qualify for Free and Reduced Lunch programs. These students are highly likely to qualify for the Federal Pell Grant – an award of up to $5,920 annually – for the pursuit of college, university or trade school programs. Many colleges and universities provide matching funds for qualifying students. Northern Arizona University awards “University Grants” of $6,000 to students who receive Pell Grants. Arizona State University offers College Attainment grants that cover all direct costs and fees. Numerous Maricopa graduates receive more funds in grants than the actual cost of attendance. The more competitive the school is, the greater the financial award. Competitive colleges accept fewer than 35 percent of applicants and usually have more intense requirements for college admissions. Many of these schools cover 100 percent of financial need. Consider Harvard, America’s oldest and most prestigious college. Harvard’s Financial Aid Initiative requires no contribution from families earning less than $65,000 per year. For families earning under $150,000, students will pay no more than 10 percent of their income to cover college costs, making the most coveted school’s attendance cost lower than in-state universities. The only catch? You have to be accepted. If a student doesn’t apply for Free Application for Federal Student Aid (FAFSA), he or she will never know what awards they might be eligible for. The application process does not commit students or parents to accept awards; it simply informs families of what aid is available. Students can apply anytime; for rising seniors (current juniors), the application window opens Oct. 1, 2018. If a student wants to earn these scholarships, they need to set that goal early. Before even attending high school, a student should decide to take the most rigorous classes and to earn the best grades they can. NAU offers the Lumberjack Scholarship to students who meet all university admissions requirements and maintain all A’s and B’s in core classes. Having this goal set before starting ninth grade helps students attain their best performance. Bernadette Russoniello is the Career and College coordinator at Maricopa High School. She can be reached at BRussoniello@MUSD20.org. This column appears in the May issue of InMaricopa. On the eve of a national election voting Americans who have yet to cast an early ballot will soon approach polls all across the country to decide on what some are considering to be one of the most divisive contests in American political history — Clinton or Trump. At both the state and federal levels, Arizonans have the potential to make history and turn their traditionally red state into a blue one. They also have the potential to introduce dramatic socioeconomic changes in the form of recreational marijuana legalization and an increase in state minimum wage to $12 an hour by the year 2020. Tuesday, Maricopans will be deciding these and other measures that may have grand effects on the government and education systems alike. One such measure is the proposed education budget override. The Maricopa Unified School District override is designed to add technological resources, staff and faculty. Residents in Maricopa have become aware of the budget woes within the school system, and some have begun to take cautionary measures to guarantee their children receive a quality education. Speaking on terms of anonymity a parent of a Santa Rosa Elementary student informed InMaricopa his child was in a classroom of 45 students with only one teacher and no aide. He said after it became clear their child’s grades began to suffer as a result of the overcrowded classroom they began considering alternatives, such as home school. Superintendent Steve Chestnut doesn’t deny there is a problem, and recognizes that teachers in the district are on average instructing classes larger than normal. The override, in his view, will essentially pad the school district’s budget so it can hire as many as 50 new teachers to accommodate the excess of students. With a larger faculty the district will not only be able to reduce the student to teacher ratio in core curriculum classes but also be able to offer additional elective classes at the secondary level. “It is true that we have some really large classes,” Chestnut said. “I get it, but we can make them smaller. In 2015 Arizona’s public schools had an average classroom size above the national average of 16.1 students per teacher, with 18.6. That same year, MUSD saw teachers instructing classrooms with an average of 21.8 students. For the 2016-17 school year so far, the average class sizes can be as high as 33 students in some high-school level core classes, and as low as 22 in some first grade classes. Some education critics cite graduation rates to grade the effectiveness of educational institutions, and then by comparing those numbers with teachers’ incomes, correlate a causality. However, statistics show this may not be true. In 2015 MUSD had a graduation rate at 85 percent, 9 percent higher than the national average, and an average annual teacher’s salary of $45,262, an amount almost on par with the state average of $46,000. In comparison, Arizona’s neighbor to the north Nevada had a graduation rate at 71 percent in 2014, almost 10 percent less than MUSD, and paid its teachers on average 20 percent more, $55,000 annually. The district claims the expanded budget will bring new teachers but it will also allow for the hiring of more support staff, like counselors and librarians, and will include money to aid the development of technological learning measures which may have a greater bearing on the quality of education than salaries alone. This extra money plays into what is arguably the most import number in the equation — per pupil spending. According to the Arizona Auditor General’s annual report for 2015, per pupil spending within the MUSD was $300 less than the Arizona state average of $9,057. Furthermore, a 2015 report from the National Education Association puts the national per pupil spending average at almost $12,000. Nevada, by comparison, spends on average $8,411 per student, $300 less than Arizona. This year’s heated election cycle has pushed the topic of education to the back burner for many Americans, but for Maricopans it still could lie at the forefront of their agenda.